This month is going to be extremely busy but for the most worthy of reasons. January is Human Trafficking Awareness Month. 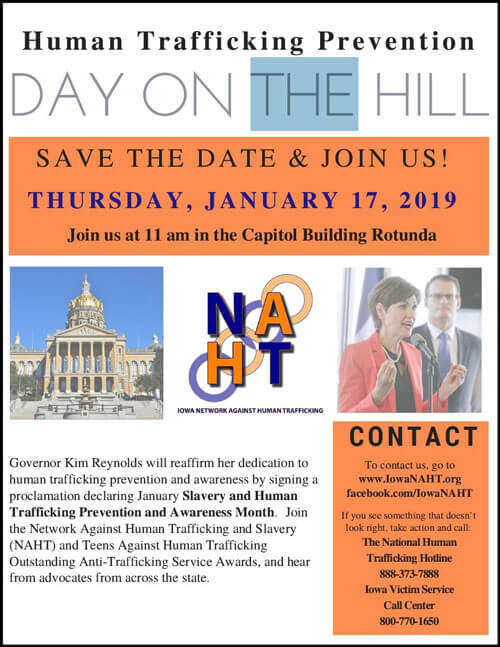 We will be working very closely with the Tri-State Coalition Against Human Trafficking and Slavery, the Iowa Network Against Human Trafficking and Slavery, the Coalition on Human Trafficking, as well as local schools, colleges, service agencies, local hotels, and even the Governor’s office and other elected officials. Most of our events this month are private but there is are three public events I would like to suggest you consider attending. Kevin Schwendinger and Lisa Schmidt will touch on several aspects of human trafficking, including historical perspectives of trafficking, how traffickers function, and who are the victims of trafficking. Additionally, they will discuss local resources and initiatives that are dedicated to combat human trafficking. There will be a question and answer session after the presentation. 18+. Free. 563-589-4225. dubuque.lib.ia.us. They are members of the Tri-State Coalition Against Human Trafficking and Slavery and we are really excited about their presentation. Human trafficking impacts our community, and it’s up to us to end it. Join us for this free training by presenter Suzie Wright, Executive Director of Set Free Dubuque, and learn the signs of trafficking and how you can help stop it. This event is open to community members interested in co-creating a better society and is brought to you by the Dubuque chapters of Teens Against Human Trafficking and Achieving Maximum Potential. And tentatively, there may be a presentation for the public in Hazel Green on January 13. More details to come. Thank you all for coming today!